Electric bikes are taking over the world, they are opening up cycling to people who may never have thought about owning a bike before and are a great option for a commuter looking to ditch their car. You will not arrive at work a heavy breathing, sweaty mess but you will be able to arrive fresh and happy, knowing that you have not added to congestion and that you are helping out the environment. You may have a problem though if you have to take a train for any part of your journey, there is not always enough space to get your bike on as other people have come up with the same idea, a great way around this was to own a folding bike, and now you can get a folding electric bike so let us have a look at the best on offer for 2017 and see if we can find your new bike for you. We have three options for you, covering entry-level to the high-end, one of these bikes will fit your budget and will make you wonder why you never thought about leaving the car at home earlier. You may sadly find that your journey home becomes longer as you decide to use your new folding electric bike to explore your local area and a bit further afield. We make no apologies for that or the big smile that this it is going to leave across your face. Our first bike is the A2B Kuo+, the best thing about the Kuo+ is that it can be purchased using some Cycle to Work schemes and there are not many good electric bikes that you can do that with, costing as it does £1000. Living in the UK means it will rain and it will rain a lot, so not only do you get a nice bike for your money but you also get a set of mudguards. Mudguards will help to protect your bike’s bearings and therefore not only stop you getting wet toes but will also protect your investment. Wet toes are one of the worst things that can happen to you as you cycle in the UK, it may seem like a very first world problem but it will quickly kill any fun in cycling and we do not want that. Being a folding bike, it has a lot of adjustable features, this means that one size fits all and you will not have to worry about the bike manufacturers way of sizing a bike. It is also ready equipped for the commuter by coming with a pannier rack and lights, this is something you will want and need especially in the British gloom and wearing a rucksack is no fun on a bike, so the rack will allow you to put your laptop somewhere safe and save you from having a sweaty back, another highly first world problem. With a removable battery pack and a kickstand, you will be able to leave it anywhere and know that it will not fall over. Importantly it comes in a few different colours so you can pick the one that suits your tastes and if you live in London it can be yours the same day and elsewhere in the UK you can see it the next working day, so you can be living with your new dream bike faster than you imagined. 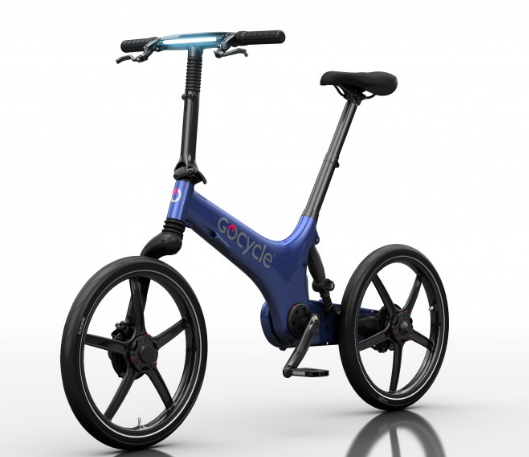 The Gocycle G3 being designed by McLaren Automotive’s Richard Thorpe means that you can very probably guess that this bike is going to be coming in as the high-end option. Aesthetically we can describe the bike as futuristic, it has shadows of a folding bike look but has its lines smoothed out and looks like it wants to be in a cyberpunk movie, making it the perfect choice for mean city streets. This futuristic look comes from the lightweight injection moulded magnesium alloy that the bike’s frame and wheels have been made from, this allows it to come in at a weight just over 16kg. This easily makes it the lightest folding electric bike on the market. So it is not just a case of fashion over function, this will make it easier to carry if you have to take it up and down stairs, or onto the subway. It also has a very small footprint when it is decoupled if space is at a premium. As the bike is both lightweight and has suspension it provides a great riding experience, whether or not you have the power on or not, and as the frame design also hides the drive chain, maintenance will also be as light as the frame. For £3495 you get a truly well thought and easy to use and ride bike. If you are feeling nostalgic than the Raleigh brand name may have already sucked you in, we then have the model name which is a rather nice pun on the concept of folding electric bikes. The Raleigh has a fantastically low stepover height, which will be great for those with mobility problems. The Raleigh could then be the chance of freedom that you need if you can not get over the frame on other bikes. As with the A2B, the Raleigh comes loaded with commuter friendly details such as a pannier rack, mudguards, and lights, it also comes in a really cool matte black colourway and as such, I can see it as the folding bike Batman would buy. If it can handle Gotham city, it can handle where you stay. In order to get you up and down any and all inclines that you may meet on your ride the bike is equipped with Shimano’s 8-speed Revoshift gearing and paired with a Trans X system with 4 power modes, you will find all hills easy work. Coming in at £1100, for a folding electric bike this is a great price, whether or not you a billionaire crime fighting superhero. Great Article Guys, i am going to pop in and test ride both of them and take one of these bikes home with me. See you soon! Today I search about folding the electric bike. I found this topic, Thanks for your share. In your post 3 of bike, I like one & I will buy it. I like Raleigh StowEway. This bike is awesome I think.it’s built quality, speed, charging, battery other specification you share in this post. Thanks to helping me. Nice post. keep it up. Next Next post: QUIZ – How much of an Eco-Warrior are you?